I ordered the Pro 16.9 from the Proform website. It arrived in just over a week. It was on sale but still a higher price than I wanted to pay. What won me over was the extra large size screen that I can surf the web on and watch my shows. The worse thing that can happen when working out is being bored. That is not very strong motivation. My workout room/office has no TV so a screen is important to me and has helped to pass the time while exercising. I do 30 minutes every morning before I shower and go to work. The other thing that is important to me is that it comes shipped almost completely assembled. I am not a handy guy and even the simplest Ikea furniture usually leaves me frustrated. The shippers were nice enough to bring it into my house and once I got the packaging off I had it setup and plugged in, in under 10 minutes. No worries about putting it together wrong or having any missing pieces. 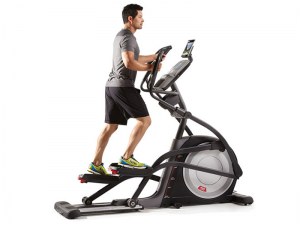 The price of this elliptical is worth just having it come assembled. Working out on the elliptical is great. After 4 months of use it still is as smooth and quiet as ever. I don't have the iFit subscription but it has plenty of workouts built into it and I have found a few programs I really like. The incline and resistance work well and at the highest settings is very difficult (which I don't really use). I have lost a lot of weight and I am glad I ended up purchasing this machine. Great workout. Very well built.